Lights. Camera.. Action... Que the fish!!!! Carlos puts a tarpon in the air!!! 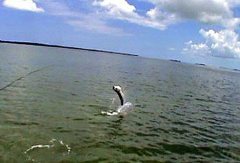 Can't believe it is the end of May already... Less then a month of tarpon season left.. This is my favorite time of year.. I love spotting schools of fish marching down ocean side beaches, following edges.... Love getting my angler in position to cast a fly... Love watching the eats..jumps.. etc.. It is spectacular..
Capt Bill Fitzimmons: Isn't great that these big fish swim in shallow water, so we can throw chicken feathers at them.. I have had several anglers ask me about the oil spill effecting the Keys.. Here is the official report. According to officials at the National Oceanic and Atmospheric There have been no physical impacts to the Florida Keys from the Gulf oil spill and none are anticipated in the immediate near future, according to NOAA trajectory forecasts. Administration and the U.S. Coast Guard, if the Florida Keys get any effects from the oil sheen currently in the Gulf Loop Current, they are expected to be in the form of small tar balls, not large amounts of aqueous oil as seen near the spill site. I have been getting a lot of last minute calls from anglers wanting to squeeze in a day of fishing... I guess the words is out!! Jack has May 27th, 28th, 29th,30th, 31st available. Come on down and put a big fish in the air!